The first time we became aware of wild horse energy was when we saw a documentary on wild horses, and we realized that these horses were like a completely different species to our domesticated ones. They had this energy which was not just an expression of their freedom, it was also a reflection of their resilience and self-reliance. They were running their own lives with a passion that was awe-inspiring. Having been around horses for a long time and never having seen this side of their nature so clearly was a little disturbing. This is not to say that our horses had always been enclosed for much of their time, or living in solitary little paddocks. Right from the beginning of our personal ownership, our horses lived together and in relatively large areas. 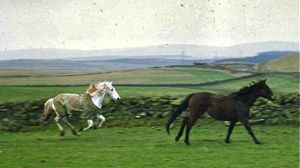 Maybe the circumstances in Scotland, where land is fairly easy to find, had inspired the general wisdom amongst horse owners that horses should go out and, being herd animals, they go out together. Over the years when we kept horses in livery, the majority of the time they went out together with other people's horses in herds of between ten to twenty individuals. This custom rarely led to injuries despite most of the horses being shod and comings and goings which would probably horrify us now! Maybe in those days the wild horse energy in our horses was stronger and we took it for granted. As with many things in our society which we have gradually sanitized and controlled until the essence of them is lost and forgotten, over time people began to protect their horses from each other and from their environment, and these horses began to soften physically and derail mentally until the dumbed down robot which stands in a tiny space all day or all night or both became a regular occurrence. Wild horse energy in these animals would be cause for worry, and heightened controls and protective measures. I remember when I had my first pony at a stables, a lady brought her dressage horse to livery there. I knew about her already because she kept him at a riding stables where I went for lessons some years before. Her horse was well-known in that he had never been out of his stable except to go to the indoor school. He had many health problems and it was naturally assumed in the gossipy horsey circles (rightly, to a large degree) that this was a result of his artificial lifestyle. When she brought him to this new yard, where all the horses lived in large herds on the side of the hills, he had his first experiences of the great outdoors, and it was a trying time for him, both going on rides and having to socialize with other horses. The point of this story is that at that time, the late 1980's this horse was a curiosity, a one-off, an anomaly - he was the exception! No-one normally kept their horses like that, and in truth, that was why he had gone 'wrong' both physically and mentally. Now in many horsey circles it is the horses who go out together who are the oddities. It is deemed as alternative if a competition rider puts out a horse in a small green square for a few hours with enough body armour to ward off a mountain lion. This change has crept in surreptitiously over twenty five years, stimulated by higher and higher horse prices, propaganda from insurance companies and ignorant conventional veterinary advice. 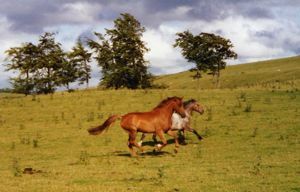 Horses kept in this way have completely lost their connection with the wild horse energy stimulated by living in a herd environment. 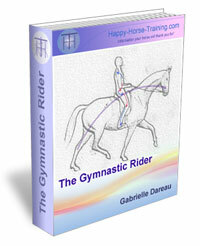 Now is the time for us to wake up and realize what we have suppressed in our horses. The wild horse energy is still there and it will come back if we face our fears and rehabilitate our horses. Recently we had a particularly wild storm one night in late summer, and we went to check the main herd in the middle of the night. 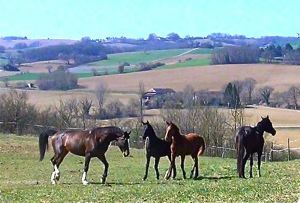 It was mainly out of concern for the girls, our warmblood yearlings (in the left of the photo below) who have been living in the herd since the spring (see the newsletter introducing them, and the issue on their integration into the herd). When the weather is wet the herd always has access to an extra field along with the steep hillside they always have as part of their paddock paradise system. This way they have more room to lie down and more ground cover than on the lanes. Not so long ago, when they were more institutionalised, we might have found them near the gate wanting to come into the stables, but this night we found them in their extra field, one which is still fairly steep sided because we hadn't known the downpour was going to be so extreme. Rather than standing huddled in a corner, they were charged with an energy which instantly brought to mind the wild horse energy we had seen in the documentary years before. The rain had eased a bit and they were setting about warming themselves up. The ground was wet and slippery and this is a rough field anyway, as well as being on a steep slope, and their balance was something to behold. Mojo the skewbald gelding was repeatedly standing up straight up on end and wheeling around as if he was on a flat all weather surface. The yearlings were excited and joining in the wild dance with the adults, although they were always surrounded by their nanny figures in the herd, Octavia, Jasmine and Ellora. We decided to let them into the more Southerly-facing field in case the rain continued, and the whole bunched charged down there via the lanes at a hair-raising gallop. One of the drawbacks of the Paddock Paradise system we had discovered was that heavy clay soil plus rain becomes lethal, especially in summer when rain creates a slippery surface on top of concrete-hard soil underneath, and we had always been careful to let them into fields at any hint of rain for fear they would slip and wrench themselves or worse. This night was a serious wake-up call! We have encouraged them to grow back their wings, and now we had to stand back and let them fly, and it was unforgettable. They went up and down the lanes and the field, and wherever they found themselves, steep or flat. They were in the wind and the rain and virtually pitch black and they were magnificent. 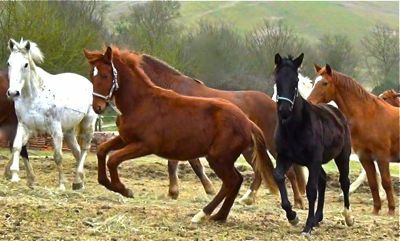 The wonderful vitality of that wild horse energy that had seemed so fascinating in that documentary was now alive in our own horse herd. Three mares were shored up on the sand crossing: Xas and Hope because they didn't feel up to the challenge, and Odette because she is Hope's friend, and that was fine because they knew their limits. 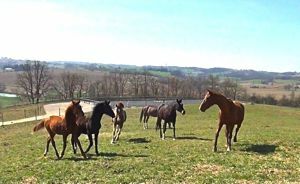 The others - warmblood yearlings included - were rediscovering the wild horse energy innate in all equines. The boost to their morale as a result of these herd experiences must be invaluable for their psychological health. Who are we to put them in a cage and cut off their wings because we think we know how to save them from themselves? The next day the horses were laid-back and enjoying the new growth which had come up as a result of the rain. Quaramba, one of the yearling fillies, was a bit lame on a front leg. It would be easy to think of this as an inevitable negative consequence of letting the horses be horses, but we don't see it like that at all. 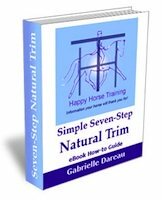 She is already a horse bred artificially for heightened suspension in her movement, and what she needs more than anything is exposure to conditions which will stimulate her ability to heal herself quicker and toughen up in general. In a few days she was sound again, and next time she gallops with herd she will be stronger. By the time she begins work as a three/four year old her bones will be dense and her tendons will be hard. Most importantly her system's innate intelligence will be powerful and awake and able to deal with whatever threatens her health. Trying to protect horses as if they were weak is the best way to make them weak. Of course helping domestic horses to rediscover their wild horse energy does not mean that caring for them conscientiously is wrong, in fact they are both part of the same thing i.e. taking responsibility for having taken away their independence. If we keep them in restricted areas we have to make sure they have sufficient shelter and food. 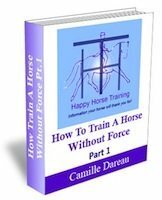 A good way of knowing if our actions are beneficial for our horses is to work out whether we are basing our decisions on fear or love. If we protect them because we are worried about them, we won't tend to make the right choices, whereas if we choose to protect them because we love them, that is a different intention, and the wisdom will become available to us to find the right solution. Distinguishing between the two is not necessarily easy, but the more aware of our intentions we become, the better we will understand and resolve our own limitations. There are no 'wrong' paths anyway, only diversions!